The Notre Dame du Roc chapel above the town of Castellane in the Gorges du Verdon in the Alpes de Haute, Provence in France. The Notre Dame du Roc chapel, in Castellane, Provence in France, was built in 1703 on top of a tall rock that towers up from the Verdon valley. This rock was the site of a fort in the old Roman town called Petra Castellana.The new town of Castellane in the Alpes de Haute region of Provence in France, dates from the 16th century and stands at the entrance to the Gorges du Verdon, where the Upper Verdon road and Route Napoleon meet.To reach the Notre Dame du Roc chapel from Castellane in Provence one has to walk along the remains of the 14th century city wall.During the 14th century the people of Castellane gradually moved from the rock and into the town lower down the mountain.Notre Dame du Roc Chapel in the town of Castellane, Alpes de Haute, Provence, France, Europe. 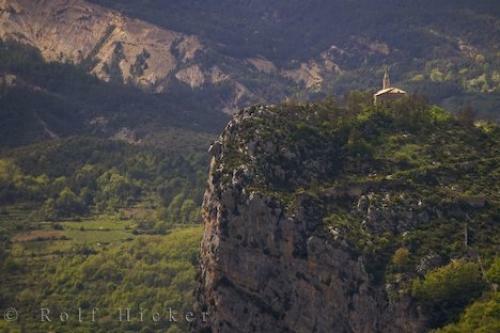 Photo of the Notre Dame du Rock chapel in Castellane in the Alpes de Haute, Provence, France in Europe.